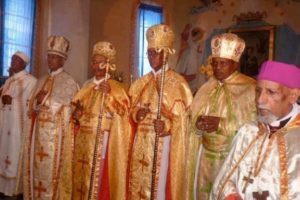 From the Bishops who, by God’s will and by the approval of the Holy See, are the Pastors of the Catholic Church that is in Eritrea: to our faithful living everywhere, “Grace to you and peace from God our Father and the Lord Jesus Christ” (1 Cor 1:1-3). At a time when world society is being perturbed by natural and man-made adversities, we “Give thanks to our God through Jesus Christ for all of you, because your faith is talked of all over the world” (Rm 1:9). With deep gratitude we recall the Countries which, thanks to their God-given sense of compassionate understanding and to their available resources, have offered you asylum. We are particularly grateful to the local Churches which, manifesting God’s care and the concern of the universal Church, are looking after you and shepherding you. Aware of how diligently you are striving to keep your faith strong and to live up to it in the midst of a world that is so often inimical to our Christian faith-values, we are writing to you “So that we may be strengthened together through our mutual faith” (Rm 1:12). The Letter to the Hebrews (11:1) instructs us that faith gives us the certainty of what we are waiting for in hope. We also know that we are “Saved in hope” (Rm 8:24). Therefore, let us be steadfast in that same hope. The pastoral visit we paid last year to the Catholic faithful in Europe, North America and Kenya (Abune Menghisteab Tesfamariam and Abune Kidane Yebio) has afforded us to gain much experience and close understanding of your situations and problems. Moreover, recently (3 May 2004) the Holy See has addressed the migrant communities of faithful throughout the world with a document containing appropriate directives and exhortations. Taking stock of the above, we have deemed it necessary to undertake a dialogue with you through the present pastoral letter. This is a duty that the Code of Canons of the Oriental Church enjoins on us Bishops. “Blessed be God the Father of our Lord Jesus Christ who… has given us a new birth into a living hope through the resurrection of Jesus Christ…and into a new heritage…It is reserved in heaven for you who are being kept safe to God’s power through faith until the salvation which has been prepared is revealed at the final point of time. That is a great joy for you, even though for a short time yet you must bear all sorts of trials; so that the worth of your faith, more valuable than gold, which is perishable even if it has been tested by fire, may be proved – to your praise and glory and honor, when Jesus Christ is revealed” (1 Pt 1:5-7). True, there might be shortcomings to what has been and can be done, due mainly to a shortage of manpower and resources, but the attention and the concern as such are evident. As it is clear from the statements of the Universal Church, expressed by the Council and by the documents of the Holy Father, such an attention and concern are constant. A program of pastoral care has been long established officially by our Church in a number of places (Kessela, Ghedaref, Rome, Milan, Stuttgart, Frankfurt, London, Washington, Chicago, Los Angeles, San Francisco). We extend our heartfelt thanks to the priests and religious men and women who, called by the bishops and religious superiors to this task, have been and are offering the best of themselves with generous dedication. We encourage them to continue this commitment with an ever better spirit of coordinated unity. We also wish to thank those members of the Church who, by their own personal initiative and zeal, are offering a commendable and fruitful service. Mindful of the urgency of faith, and of the salvation of souls, you have not only kept your commitment high, but have striven to keep it so in your own children and in your sisters and brothers. We thank the Lord for enabling you to such a mission. Our appreciation goes to the dioceses, parishes and individual priests for the care, support and cooperation they have generously accorded to you in the cities and countries where you live. When we ponder all such God’s blessings, a word of gratitude springs from the depth of our hearts: “The Lord has done great things for me” (Lk 1:49). We thank and praise him. To do so for us means, at the same time, to enter a commitment: to work with an ever growing dedication and strength at the present and in the future. We are knowledgeable of how you endeavor to preserve your identity and your faith, to reach out to the family members you have left back home, to keep up the fundamental principles you have inherited from your forebears and which are the basis of an integral human maturity and growth, and to bequeath all such principles to your offspring. Filled with sincere admiration, we again wholeheartedly thank you. A number of years ago (1978), a poll taken in a small parish in Asmara revealed that two thirds of its membership lived off the subsidies contributed by their children and family members abroad. It can be taken as a sample of a country-wide trend. It is a manifestation of a culture and a mentality that are deeply rooted in a spirit of mutual care, in the evangelical love for neighbor, the result of our community-oriented way of life. This in turn exhibits how much our tradition and culture are shaped and nurtured by the Christian spirit. We know of the admiration with which the citizens of the countries where you live look at the selfless open-handedness with which you share the fruits of your hard labor and your limited resources with your national community and family members back home. This is an extant example of how you have deliberately rejected the ungodly, unchristian spirit of saying: “I am all for myself”, “Myself before anybody else”. People who come in touch with such a spirit will certainly experience a sobering call of conscience or even a sense of remorse. Yours is an attitude that is very much in tune with St. Peter’s recommendation: “I urge you, my friends, as strangers and nomads… behave honorably among gentiles so that… when the day of reckoning comes, they give thanks to God” (1 Pet 2:11-12). “Have your answer ready for people who ask you the reason for the hope you have. But, give it with courtesy and respect” (1 Pet 3:15). So, be steadfast in Faith. Your eagerness to remain in touch with your country of origin, and to cherish a sense of belonging through a variety of ways and means deserves a distinct mention. An emblematic aspect of it is, besides your material contributions, this strong sense of identity and the communion that you share through direct encounters or by electronic means in times of joy and sorrow, in times of happiness and trouble. The importance of a community-oriented moral life and action can hardly be overstated. To turn away from individualism, and be able to free oneself from the “I-am-free-to-do-whatever-I-like”, “I-don’t-care-about-what-others-may-have-to-say” attitudes, gives one’s life a significance and an orientation. And this, in turn, leads to that spirit of gentle attention to the others which is so essential to a shared journey of life. As this is not an easily achieved purpose, it takes hard work, courage, as well as a clear and straight conscience, in the face of cultures that are dominated by “one’s own personal liking” as the ultimate criteria of choice and action, with total disregard of what others may have to say. The migrant is one who has chosen, or has been compelled to choose, exile from one’s own country or home. A political situation, economic constraints, the search of a job, education or research pursuits… may be some of the factors behind the phenomenon. The migration of individual persons, families and entire communities of peoples is as ancient as human history. This is exemplified in our own salvation history: from the children of Jacob’s exile to Egypt to the Holy Family’s migration to the same country… Scripture takes migration as a symbol of the faithful’s terrestrial life-journey. UNO statistics show that, in the last thirty years or so, the number of migrants has swelled from 75 million up to 125 million worldwide. In this, its new global dimension, it has virtually come to affect all countries in the world. All sorts of unbalances within one’s own country, cross-border movements, legal or illegal transfers, and many more complex reasons and factors are behind the same phenomenon. Nonetheless, if we look at our own country and people, we have to say that overseas migration into far-off lands is a recent development. Unknown and unheard of to our forefathers and fathers, this experience has unfolded in the last forty years or so, as a result of the economic and social predicaments caused, in turn, by a sequel of political upheavals. From among the positive aspects of a migrant’s life experience, we can mention the mutual acquaintance and the growth of dialogue in the daily life among different peoples. This undoubtedly leads to harmony and unity. At the same time, contacts with different civilizations can be bearers of wealth and prosperity. Further, this experience is a school where migrant-hosting countries and immigrant peoples can learn to live together in mutual love and respect. Inasmuch as migration involves separation from family and home, and new ways of life in unknown countries – with all the unavoidable uncertainties and anxieties it entails – is hardly a voluntary choice. One has to live through numerous physical hardships and bitter psychological experiences. All of you have gone through such processes. Each has a story of his own to recount. To live and work in alien lands, in a restless struggle to build one’s own personal and family life – invariably starting from scratch – is something the result of which is inevitably moral and psychological weariness and lonesomeness. Long and tortuous treks – laden with uncertainties, lack of proper documents and residence permits, impossibility to accede to decent jobs and life conditions, because of a lack of qualified education and experience – are quite often the source of stress and deteriorating health conditions. To move into, and live in, an alien land as an exile, coming from communities whose culture is firmly rooted in God’s healthy fear (=Timor Domini), strong family values and respect for human dignity, is something very much akin to becoming like “a fish drawn out of the water”. Struggle for life becomes then a daily experience. The impact that this has on the moral and spiritual life of people is apparent, and is obviously reflected in the concreteness of daily life. It becomes a matter of having to choose between: sticking to the moral principles and human values that have shaped one’s life hitherto, or conforming oneself to an altogether new value-system; between consolidated ways of life and passive and chameleon-like adjustments to fleetingly changing life styles; how do I justify behaviors to which, if I were still home, I would never yield? Would my conscience accommodate itself to that so easily? These are only some of the critical questions that life in exile brings with itself. How should one integrate, at both the psychological and concrete daily life levels, the spiritual, cultural and social values inherited from one’s country of origin with those found in the new homeland? To adapt oneself to new social contexts, while entirely forsaking one’s own cultural background, is something that will lead to an unavoidable and harmful identity-crisis. On the other hand, imagine what the result would be, if one were to shut one’s own door, to close one’s eyes and ears to dialogue, to interaction and to a healthy give-and-take relationship! All of this sufficiently shows how life in exile may become charged with not easily quantifiable, difficult, external and internal problems. Along with all of this, we cannot omit a mention of the problems and conflicts that family life has to face, owing to the differences of age and mentality. The difficulty to integrate traditional cultural values with modern western moral and social standards is part of the same problem. How many families have disintegrated, as a result! How many parent-child relationships have broken down! Family life is one of the realities that are most adversely affected by the internal and external, material and spiritual problems of migration. Involuntary separation, both between spouses and between parents and their children, is one result of it. Isolation itself has its own consequences. Above all, the unity of marriage and family can be seriously damaged. This can be seen both in the time before the family members are re-aggregated in the country of migration, and thereafter. Over-work, as well as unbalances between work and rest schedules, often end up by depriving people of the joy of togetherness and of the unity and the warmth of family life. Isolation, loneliness and other problems of social life are often at the basis of situations leading to the breakdown of marriage and family ties, to divorce, and to misunderstandings between parents and children. As a result, drug and alcohol addiction and other forms of moral degradation may occur. Among the migrants there are individuals who have left their country in their early or late adulthood and may be fast approaching old age. We know how much they can be threatened by frustration, loneliness; weariness and the problems of old age. It is normal for them to look back to their homeland and their age-mates there with a deep sense of longing. People living in such conditions should perhaps be encouraged to think of the possibility of returning home for a time of rest or even resettlement. Women are often the main bearers of all such experiences of psychological and physical hardship. It is on their shoulders that the problems of migration weigh most heavily. This segment of society includes: women who are engaged in actual married life; those who do not have the benefit of such a settlement and live by themselves on their own work; those who, having experienced the failure of a marriage, have to manage their own life and the life of their children single-handedly; those who have borne children outside of marriage and have to take care of them without anybody’s help… These are all women who have to work hard and improve their life conditions while shouldering double-parent duties and responsibilities. As much problematic is the situation of women who have never been able to enter married life and are doomed to live in solitude, with all the uncertainties of what the future may hold for them. Small associations along the lines of our mothers’ traditions may very well foster mutual support and solidarity. It is clear, though, that there can be no better remedy than to entrust oneself to the Lord Jesus Christ. Let them therefore strengthen their faith in him, increase their love for God and neighbor, and hold on to hope. We all understand how difficult and soul-troubling it is, for our sisters and daughters, to live in societies which weigh every thing by monetary and wealth standards, by external freedom and material wellbeing, while trading on women’s life and honorability, ignoring the wholesome greatness of their dignity. There is only one way out of such and similar situations: never come into compromise with our consciences; rather, stick fast to the enduring faith-values we have been imbued with as we grew up. There can be no trading of our identity and fundamental values for ephemeral temporal pleasure. Young men and women who had to leave their country of origin at an early age, or were born and brought up abroad, are faced with an ambiguous situation: that of being native by birth and blood, and foreign by culture and the surroundings in which they live! The uneasiness that such a situation creates to them is quite patent. The fact that statistically the younger members are taking an increasingly larger share within the migrant community is also a cause for some concern. In fact, it raises important questions and problems: are our young men and women equipped with a sufficient fund of knowledge and experience while they step into an unclear and undefined future? Can we hope that they are self-confident enough to be able to continue their life-journey on their own? We do know that there are young people who, left at the mercy of such troubling problems, have given themselves to drugs or, even worse, have seen suicide as the ultimate, desperate outlet. Easy enough to imagine the despair of families in which such cases occur. Can any remedy be suggested for these and similar tragic occurrences? We think of the possibility of turning to centers with Christian faith-based orientation programs and aggregation. To help them to re-establish some sort of bond with their country of origin may also have a degree of healing effect. The Code of Canons of the Oriental Churches (can 27:28;148) recommends that the Eastern Liturgy, inasmuch as part of the universal Church’s patrimony, should be duly preserved. Norms and directives for that purpose are spelled out (Can. 41:150). Church authorities and ministers at all levels (Bishops, priests…) are not only recommended, but required to offer collaboration and assistance to the faithful of other liturgical traditions in their dioceses and parishes (Can. 192.1). Canon Law also recommends that all ways and means that will enable them to preserve and foster their particular tradition of Christian worship should be employed (Can.193.1). Wherever possible priests should be assigned (193.2). While this is what the Church recommends, the faithful should be eager to cherish their heritage and transmit it to the new generations. When you, the migrant Christian communities, wherever you are, leave and worship in unity, no doubt you will not lack the support and the care of those who, in the Church, have the competence and the authority to assist you. We recommend you to give the utmost interest and attention to the programs of Christian education, both for yourselves and for your children, for this is an integral part of our Christian life and identity. In order to give stability to marriage life, to ensure that fear and love for God and neighbor permeates our lives and accompanies our journey, we need to have a sound Christian formation. We need to conform our concrete ways of living and behavior to the demands of an authentic Christian spirit. There is nowadays not only a tendency to believe, but an unashamedly declared claim to the effect that “Christianity should only be about other-worldly concerns”; in order to succeed in this world one needs not be concerned with Christian faith and with its teachings.” The truth of the matter is that reason, if correctly used, is not contrary to faith. Christianity, far from being at odds with progress, is its most favorable ally. Certainly, authentic Christian life requires courage, strong determination and unwavering commitment. But history is there to show us that great deeds can be achieved only through such feats of courage. Hence our recommendation to you: be faithful to the principles of your Christian life and morals. Give a look to the Ancient Testament story of Tobias for an inspiration. While living in an alien land among the heathens, Tobias obeyed God’s laws and his fathers’ traditions to such an extent that these became the distinguishing feature of his identity (Tb 1:17-21). He fed the hungry, assisted the seek, buried the dead, consoled the afflicted, fulfilled all acts of spiritual and physical mercy. Tobias’ experience mirrors the purpose of a truly committed Christian faithful living in alien land (Tb 2:1-14). By living up to his religious principles and faith-guidelines, he became an example to the people among whom he lived. We plead, you parents, to set an example to your children in a diligent study of the Catholic Catechism. Many of you live off a knowledge they have acquired in their childhood. We encourage you to refresh and further develop it through helpful, appropriate Christian formation programs. Good will is the secret of every success. As before God all of us are children, for you to take the lead in this endeavor before your own children is the most inspiring example you can provide them with. We will inherit God’s kingdom only by becoming “Like the children” (Mt 19:13-15; Mc 10:14-16; Lk 18:15-1). Scripture, the quintessence of God’s word, is of course the choicest among all the writings in this world. Wisdom and intelligence, love and mercy, life’s meaning and goals, doctrine and inspiration, are condensed here. Above and besides everything else, it is here that man can find “The way, the life and the truth” (Jn 14:6). It is, therefore, indispensable that you find times and opportunities for an attentive listening to God’s word in the midst of your busy and often restless daily lives. Certainly, instruments that may assist you in this effort are not lacking in the countries where you live and in the languages spoken there. But you may also take advantage of your visits to your home-country to assemble spiritual writings that are also available. These will certainly help you to nourish your journey, renew your faith, and refresh your spirit. Keep your light shining, be steadfast in hope, “So that you remain faultless and pure” (Phil 2:15). “Let your minds be filled with every thing that is true, everything that is honorable, everything that is upright and pure, everything that we love and admire, whatever is good and praiseworthy” (Ph 4:8). Wherever life’s necessities compel us to go, we must be careful not to forget what we cannot afford to, i.e. our relationship with God! We should never be fooled by temporal pleasure and comfort. Let us not mislay the ultimate purpose of our being on earth. Human heart will remain restless until it settles in God, for that is the ultimate refuge for mind and soul. Worship is where our relationship with God is attained in its fullness. The Sacrament and the practices of penance are nowadays dramatically declining or, indeed, disappearing in western societies. Yet, Confession remains the only hope for all those who are afflicted by spiritual and moral loneliness and are faced with life’s manifold and burdensome challenges and temptations. Professional psychologists are more and more coming to this same realization. By heeding Jesus call, “Come to me, all you who labor, and I will give you rest” (Mt 11:28), life is regenerated. Strengthened by penance, it is enabled to journey through the vicissitudes of this world. We know how tough and long this journey can be. Let us therefore give a heed to the Lord who is advising us: “Get up and eat or the journey will be too long for you” (1 Kgs 19:7). Let us partake in the Holy Eucharist, the Sacrament of Christ’s Body and Blood, the food of life, our source of spiritual energy and moral vigor. To do this, we do not need to wait for the great liturgical festivities and for the occasions when liturgy is celebrated in our own rite. We should avail ourselves of the closest Catholic Church or chapel to carry out our religious duties and meet the Lord. Besides the Sundays and great festivities, we should not forget the celebrations in honor of our Lady and the Saints throughout the year. These are times and opportunities when we can turn to the Lord and take care of our spiritual needs. In the history of the early communities of the Church we read about how the Christians living in better-off areas met the needs of their less fortunate, exiled or persecuted brothers and sisters. Collections of money and other resources were organized (1Cor 16:3). Many of you do offer their own share to the local Churches where you live and, thereby, contribute to the works of mercy carried out by the universal Church. We commend you for that. Your support to the pastoral and social activities of your home Local Church is also not new. We thank you for what you have done so far. It is our wish that, even in the future, you continue your active collaboration in a manner that will guarantee coordination and an evaluation of the initiatives that are undertaken. This could perhaps be done through our Central Coordinating Secretariat. We are writing to you so that “Your surplus at present may feel their deficit, and another time their surplus may fill your deficit” (2 Cor 8:14). This is best done when, by generously stretching your supporting hand, you join in the various initiatives coordinated by the “Little flock” that is in your home country, “So that you always have enough for every conceivable need, and your resources overflow in all kinds of good work” (2 Cor 9:8). “The one who so freely provides seed for the sower and food to eat will provide you with ample store of seed for sowing and make the harvest of your uprightness a bigger one. You will be rich enough in every way for every kind of generosity” (2 Cor 9:10-11). The Family, the backbone of society, is one from among the institutions that are most affected by the negative impact of contemporary trends. The damaging effects of the social and economic development programs being pursued in most of the western countries, where our migrant communities live and work, have been acknowledged by those societies themselves. This is a time in which the Church is employing all the resources at her disposal to stem the damage, and defend and build-up the family. Great foundational values such as matrimony, parenthood, offspring, etc. are loosing their lofty connotations. In our own language and Christian tradition the spouse is referred to with such a dignified terminology as “ኣሚን = faith-mate, በዓል-ዕጫ = fate-mate, በዓል-ኪዳን = covenant-mate, በዓል-ቤት = home-mate”, reflecting the concept of permanent inseparability. Nowadays, instead, there is a whole new terminology (ዓርኪ= friend, ብጻይ =companion, buddy…) which, referred to marriage, exhibits the extreme precariousness and flippancy being attached to it. This, obviously, amounts to emptying this lofty institution of its greatness and dignity. The question of duties, rights and equality in family relationships is often tackled in such an inapt manner as to shake it in its very foundations. When unrestricted pursuit of money and unbridled pleasure takes over, and responsibilities are forsaken, then the family and all the values that go with it become a complete shambles. It follows that divorce becomes a routine; ambiguous and undefined unions prevail; the family ceases to be a home and a shelter. If compassion is lost towards children (to the extreme of child abuse) as well as towards the elderly and the sick (euthanasia), then family life is condemned to a mere survival in the shadows of a culture of death. In such circumstances as these, we cannot but repeat: “Do not model your behavior to this world.” (Rm 12:2). The Family, a Gift from God. Children are a most precious gift of Their life is sacred, endowed with full dignity and rights, right from the earliest moment of its conception all through the various stages of its growth. Any attempt against this otherwise vulnerable and undefended creature is a crime. Who gives life to the family is God himself, every Love, patience, generous dedication… are the virtues through which we become worthy of such a gift. An all-embracing love and reciprocal care are the hallmarks of a truthful family life. The family is a gift to the whole of It is a school where we learn mutual respect, support, compassion and self-restraint. It is above all a gift to Christian life and to its evangelizing Through common prayer, faith-sharing, mutual compassion and self-giving, it contributes to the spread of Christ’s message in the world. If mutual care and concern are to permeate family life, it is critical that the members have opportunities for not only living together, but also for praying together, exchanging thoughts and experiences, and for faith-sharing. Violence against expatriate women has been reported in a number of This should make us vigilant with regard to potential or real victims of violence among our migrant communities. Parents have the right to select those educational institutions or schools they consider fit for their Nobody can replace parents in such a basic responsibility. It should be their utmost care to protect their children from the negative impact coming from government or privately owned mass media. John Paul II, in a meeting with families in 1994, said: “Families, you are the hope and the joy of humankind”. By fulfilling the ideals we have tried to outline above, our families will really become a leaven and a sign of hope in this society. If nations, and indeed the whole world, are to achieve peace, focus must be once again placed on the family; for it is here that morally healthy, dedicated, and mature servants of their nations and peoples are cultivated. A mature and solid family is the seed for a mature and solid society. That is why the family is said to be the hope of mankind. One of the most pervasive tendencies today is to live just for momentary pleasure and transient fulfillment: “Only that which fulfils my desires in this moment has a meaning and deserves to be pursued. I don’t care about all the rest. Success now and here… and nothing else.” This is a way of living that ruthlessly mixes-up right and wrong, obeys to a shortsighted materialistic pragmatism, is totally unconcerned with moral principles and problems, and is insensitive to the voice of the conscience. When this mentality becomes an all-pervasive norm in one’s life, it is quite easy for one to forget the others, their problems, and to focus only on oneself. This attitude can hardly be seen separately from individualism. Indeed, it is strictly entwined with it. Great vigilance is needed to avoid that the mere logic of profit becomes “the” priority in one’s life. Mutual care and attention among spouses, children, and family members are, instead, the most basic requirements for a healthy family life. Human life must be respected. The moments of mutual care and/or concern we share on such occasions as our children’s baptisms, or our family members’ illness or death are manifestations of our respect for, and love of, human life and for all God’s creation. If we are able to preserve what we already have in store in this regard in our own culture, there is much we can offer to other cultures and peoples as well, “So that seeing your good works, they may give praise to your Father in heaven” (Mt 5:16). “There can be neither Jew nor Greek, there can be neither slave nor free man, there can be neither male nor female – for you are all one in Christ Jesus” (Gal 3:28). Unhealthy and narrow ethnocentrism is undoubtedly one of the most disconcerting phenomena in today’s world. The various stages through which men and women, right from their early childhood, become part of world society can be the basis for authentic growth and progress only if that process moves on along a proper line of relationships. If this is lost sight of, then fanaticism creeps in. Inevitably then, one tends to assert only one’s own identity and to disregard the others. Dialogue becomes impossible. The search for personal superiority and self-promotion, at the expense of others, becomes the only driving force in one’s life. Since the result is reckless competition and conflict, timely vigilance needs to be exerted. Plurality and diversity must bring to communion, not to rivalry. To respect the others means to accept them “as they are and for what they are.” Tolerance and mutual appreciation are values that our migrant communities need to develop, and about which they can learn much from their hosting countries. If you allow the all-embracing spirit of Catholicism to prevail among you, it will give a great sense of balance to all your relationships: gentleness towards the others as brother human beings, brotherhood with fellow nationals no matter of the difference of ideas and beliefs; harmony and Christian brotherhood with your fellow Catholics, beyond all cultural differences. Our relationships with the members of other Christian Churches are based on our single brotherhood in Christ. This spirit must be enhanced. We also recommend mutual respect for, and friendship with, our brothers of Islamic faith. Mutual tolerance and understanding between husband and wife, among family members and relatives, as opposed to the inclination to prevail on one another, shares very much of the same spirit as we hove tried to outline above. Living in a world marked by pluralism, there should be no room for narrow and rocky close-mindedness. Dialogue is the right attitude and the fittest means. For, without it, no exchange of thoughts, no reciprocal acquaintance and appreciation is possible. While we have been created each one with his/her own unique qualities and gifts, we must respect the gifts and the qualities that the Creator has endowed the others with. If our human-cultural values and Christian roots are made to become the foundation and the core of our moral integrity, then our lives will abound with fragrant fruits; their light will expand to enlighten our brothers and sisters. For, as Paul puts it, “To God we are the fragrance of Christ” (2 Cor 2:15). The same Apostle goes on to add: “Work out your salvation in fear and trembling… So that you remain faultless and pure, unspoiled children of God surrounded by a deceitful and under-hand brood, shining bright among them like stars in this world” (Fil 2:12-15). In order for you to fulfill such a mission, we recommend you to be fruitful branches in the one Catholic Church expressed by the community of believers in the countries where you are. To say that the Church is Catholic, i.e. universal, means that she embraces everyone, everywhere. Wherever you are, you must feel to be the children of this one and caring Mother. To treasure one’s own cultural heritage should never have to mean to spurn other cultures. It means to be able to come into a communion of brothers with one’s own cultural assets and resources. It is a mutually enriching relationship whereby “Your surplus fills their deficit and their surplus fills yours” (2 Cor 8:14). Therefore, the care and concern you have about preserving your cultural and spiritual identity should by no means lead you to close your doors to the others. It rather has to help you consolidate your identity so as to be able to offer the best of it for the common and reciprocal enrichment, within the Church and among the peoples. “…Yahweh Sabaoth, the God of Israel, says this to all the exiles deported from Jerusalem to Babylon: build houses, settle down; plant gardens and eat what they produce; marry and have wives for your sons, find husbands for your daughters so that these can bear sons and daughters in their turn; you must increase there and not decrease. Work for the good of the city to which I have exiled you; pray to Yahweh on its behalf, since on its welfare yours depend” (Jr 29:4-7). 26. Motivated by our pastoral care and love, we are sending out these words of hope and consolation to all the Catholic families and individuals One of the chief aims of this message is to indicate that our hope and attention focuses on the family, which we wish to see filled with Christian spirit and enlightened by the Gospel; a family that caringly rears its members and nurtures them with love and faith: what a blessing for a nation and for the whole of society! Hence the importance of unsparingly striving to strengthen the foundations and promote the wellbeing of our families. Catholic faithful, keep always high your consideration for the greatness and the dignity of marriage and family, as you continue to strive to bring forth the warmth and the light it holds. Our families are like precious gems that must be defended and protected even at the cost of the greatest sacrifices, particularly in times of trial and distress. We recommend you to give a thought to the possibility of having vocations to the consecrated life among your children. Mindful that one day they will return to minister to you, do not hesitate to take concrete initiatives to promote such vocations within your family. There is no question that we have to transmit to the new generations the human and cultural heritage that we received through the family. As much indisputable is that this demands a diligent and arduous effort. It is in such difficult and trying times and places as ours that your Christian education should become the expression of your identity and the guiding principle of your lives. As you bring up your children with all patience, do not limit your effort to simply trying to fulfill their search for material satisfaction. Rather, be a living example to them. An accomplished human maturity rests on moral integrity. Therefore, be aware of how wrong the “you-are-what-you-achieve” philosophy is. “I have written to you, young people, because you are strong, and God’s word remains in you, and you have overcome the Evil One” (2 Jn 2:14). “Let no one disregard you because you are young…” (1Tim 4:11). Do all that is good and is possible in the time and the life conditions you are in, under the inspiration of your Christian faith. Pass on to the following generation the hope, the faith and the love you have in turn received. It is only by remaining deeply rooted in faith that you will be able to overcome the so many and disheartening problems besetting the contemporary world. It is Christ, who has won over the world, who is calling you to this commitment. We encourage you to live to the full the life that God has graced you with, to offer to the Church and to the society your contribution as active and responsible members. Be strong in opposing all efforts that are employed in order to displace God from the center of human life. Be witnesses of Jesus Christ in the world. He is the only way, truth and life. The contribution that Catholics with better opportunities for higher education, research or successful business enterprises are making to their country and people, cannot be underestimated. Debates and comparative academic studies on the relationships between their native cultural backgrounds and the complexities of the social context in which they live, would certainly be of the greatest interest. By combining what has already been achieved and what still needs to be achieved, such studies would show how productive a migrant’s life can be, in spite of all the adversities it entails. We encourage the younger generations to deepen the knowledge of their cultural and spiritual roots, so as to move about with a mature sense of self-confidence. Our adult men and women, who have entered the western social and cultural context either by mere chance or, anyway, without a specific preparation, are expected to meet the challenge with wisdom, dignity and responsibility. It is their responsibility to contribute so that faith may continue to hold the role it deserves in private and public life. We know in fact that much of the decline of values in the western world is attributable to the neglect to which life’s faith dimension has been confined. In general, our call to all those who, either through hard work or by a happy coincidence of events, have been successful in their pursuit of study, work, or business, is to avoid avarice and isolation from the community and the society at large. It is by sharing with others the blessing they have been graced with that they will fulfill their responsibilities and Christian mandate, and thus contribute their share to the civil society. Once again, on behalf of our Dioceses, we wish to renew our deepest appreciation to the local Churches of the Latin Rite; for all that they have been doing for our sons and daughters through all these long years. We know we do not need to recommend them to continue to confirm our communities in the one faith hope and charity as they have been doing so far, tirelessly. We all need to continue to pray together for the displaced, the exiles, the orphans, the widows, the prisoners, for all those who are faced with so many difficulties and problems. It is the responsibility of all of us to work in order to prepare a bright future for them and, above all, to strengthen them in their faith-journey towards our final destiny: eternal salvation. May He accompany you and be with you wherever you are.